Don't get locked out of your hot rod! If you have shaved door handles on your hot rod and rely on power solenoids to open your door you need an emergency pull cable in case of power failure. 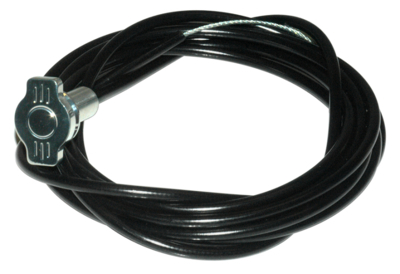 Rocky's emergency pull cable features a CNC machined billet know and sleeve. Kit comes complete with 10' of cable, line clams, screws, and speed nut. Also works great for trunk or hood release cable. Have you ever locked your keys in your car with no way to get in? Dead battery? Rocky's Emergency Pull Cable is a must have item. Mounts under the car for easy access.